I know… It’s only the first week of October, but you’ll thank me for talking about Christmas before Halloween when you hear that registration is about to open for one of the hippest, coolest holiday events in Frisco. The 4th Annual Frisco Santa Pub Crawl is back and they’ve raised the bar (in more ways than one). Before I share with you the history of this cool fundraising event, allow me to outline for you what is sure to be a great time on December 2. Imagine 250 Santa-clad Frisco-nians galavanting around the downtown Frisco area. They all pile into fancy charter buses, singing carols as they “crawl” to four of our local nightlife establishments where they’ll eat, drink and be (very) merry, all the while raising important funds for charity. 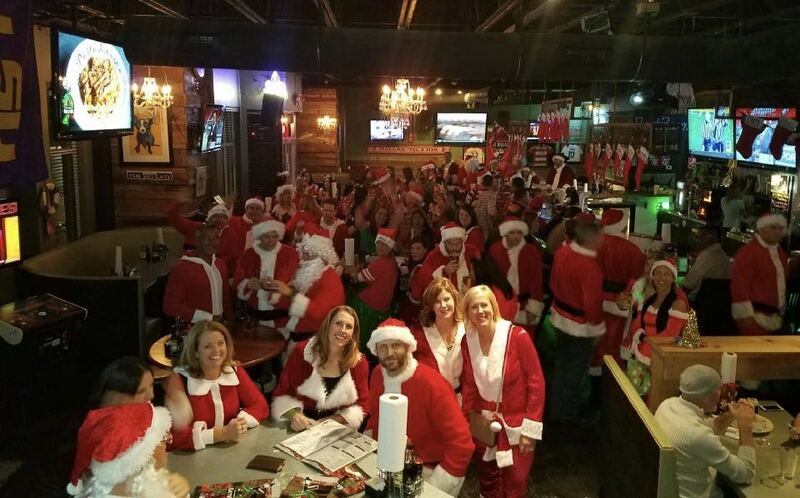 The Frisco Santa Pub Crawl is more than just a chance for responsible adults to pretend they’re in college again for one night. A 501c3 nonprofit organization (under the name Frisco Santa Charities), their mission is to rally the community and raise funds that make a direct impact in North Texas. This year the beneficiary is Frisco Fastpacs, a local charity whose mission is to ensure that no child in Frisco has to endure hunger outside of school hours. The event will donate 100% of the net proceeds to the charity, working diligently to keep expenses as low as possible. In the last couple of years, the pub crawl has been able to give $10,000 to each of their benefiting charities, and this year, they hope to raise even more. This year your $50 registration will include a ticket to the pub crawl, a seat on the party bus, a Frisco Santa Pub Crawl tumbler, and an invite to the end of night finale party. You’ll be given a punch card for two drinks per bar at heavily discounted Pub Crawl prices. The ridiculously fun time with friends, photo ops and memories…well, those are free. The committee works year-round to develop relationships with sponsors, donors, and Frisco’s local bars and restaurants. Cultivating an interest in the event isn’t a problem; the phone starts ringing well before the event and everyone is eager to be a part of it. It’s capacity issues that are a challenge because each establishment has a maximum number of people they can hold. To work around this, the registrants are divided into four equal groups which this year, will rotate simultaneously between The British Lion, The Green Gator, Stan’s Main Street, and fingers crossed, the Frisco Rail Yard (weather permitting). The entire Santa pub crawl of over 250 “Santas” will finish and party at the brand new Concrete Cowboy at The Star. Each venue will offer live music or a DJ, and their food menus will be available for purchase to those interested. So who’s behind the event? Kristen and C.B. Williams brought the event to Frisco after experiencing a Christmas-themed pub crawl on Bourbon Street in New Orleans. It was a blast, and they knew the demographics of Frisco would likely support an event of that kind. It was important to Kristen and C.B., however, to add the element of fundraising and leverage the event to make an impact in the community. They gave it serious thought for nearly a year. “Can we really do this?” Naturally, they bounced the idea off their closest friends, some of whom would become the founding committee members of what is now a 501c3 nonprofit organization. The event has grown from about 60 people in year one to nearly 250 last year. While they’re excited about the growth of the crawl, the design of the event brings with it certain limitations. While the committee enjoys facilitating a fun night of memory-making for the community, they never steer away from the primary goal of raising money for charities in North Texas. In year one, they selected the North Texas Autism Association, which was a cause personally near and dear to their hearts. In year two, they were able to donate $10,000 to REACT, a neuromuscular rehab program for those recovering from spinal cord injuries. Last year, they selected the Fisher House, an organization which directly supports military families, and again they were able to donate $10,000. This year, the event will have a direct impact on our Frisco children who are meal insecure. Meaning, outside of the FISD school meal programs, they’re not always guaranteed to have food at home. Frisco Fastpacs has a deep empathy for local children who experience hunger on a regular basis. They directly meet the need through food drives, meal bag assemblies and partnerships throughout the community. The Crawl wants to donate as much money as they can, so it’s important to keep expenses low. Transportation is their biggest line item, so a quality transportation sponsor is high on the wish list. There are multiple opportunities for branding rights for sponsors who wish to see their name on the event materials, social media shares or photo props. Businesses or individuals can also contribute items to the live auction which occurs a few days prior to the Crawl. Kristen, Amy and Marla work around the clock to procure items for the online auction, which last year raised $2,427. On the evening of the auction, usually the committee hangs out at one of the participating bars, laptop computers open, and they manage the auction together until everything is sold. Knowing that Frisco will continue to grow and provide additional venues over time, the committee expects to be able to bust through the registration ceiling in no time. They’re dreaming big. C.B. would love to shut down Main Street, allowing participants to walk from venue to venue. Kristen has her eyes on The Star in Frisco. Imagine hundreds of “Santas” covering Dallas Cowboys World Headquarters. Registration will open October 20th, but they’re in discussions with potential sponsors NOW. Follow Frisco Santa Pub Crawl on Facebook so you’ll receive notifications, event updates, and more information about the live online auction. Or, reach out directly at friscosantapubcrawl@gmail.com. The number one registration rule? We want to see you dressed up from head to toe! None of this “just a hat” business. Judging from the photos, it’s a huge element of the fun! This event is for adults only, so lock in that babysitter right now!